Celebrating the life of Victor M. Corey Jr.
Obituary for Victor M. Corey Jr.
Victor M. Corey Jr., 81, of Byron, passed away peacefully on Saturday, January 26, 2019, at the United Memorial Medical Center in Batavia. He was born in Batavia on November 6, 1937, to the late Victor M. Corey Sr. and Edna J. (Spencer) Corey. Vic was a United States Army veteran who served overseas in Schweinfurt, Germany, where he met his wife of 61 years, Rosemarie. He worked for many years at Oxbo as a technical illustrator. 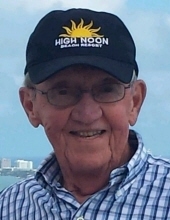 Vic was an avid reader, loved crossword puzzles and ice skating, and was an ardent outdoorsman who loved to hunt. He was also an enthusiastic Sabres fan and was extremely mechanical, having built both a working tank and Humvee piece by piece. His friends and family will fondly remember his appreciation for corny jokes and his talent as an artist. Vic was a very talented artist who loved painting and woodcarving. His art was often displayed in the area, including at Go Art and the Richmond Memorial Library in Batavia, and at the Art Council for Wyoming County in Perry. He is survived by his loving wife, Rosemarie G. Corey; children Cinda (Tom) Quattrini of Byron and Jeffrey (Donna) Corey of Byron; sisters Jolene (Richard) Folger of Batavia and Linda Featherston of Homer, LA; grandchildren Vanessa (Ryan Favata) Phillips, Stephen (Camille) Quattrini, Timothy (Roxanne) Corey, Michael Fraser, and Richard Fraser; greatgrandchildren Victor, Skyler, Dani, Thomas, Jayna, Matthew, Anna, and Isabella; along with many nieces and nephews. There will be no prior calling hours or services as Vic’s wishes were to donate his body to the U of R Anatomical Gift Program. There will be a Memorial Service at a later date. In lieu of flowers, memorial contributions may be made to Pulmonary Fibrosis Research at U of R, c/o Dr. Matthew Kottmann, 601 Elmwood Ave. Rochester, NY 14642. For more information, please call 585-343-8260 or to leave a message of condolence please visit www.gilmartinfuneralhome.com. Arrangements completed by Gilmartin Funeral Home & Cremation Company, Inc. 329-333 West Main Street Batavia, NY 14020. To send flowers or a remembrance gift to the family of Victor M. Corey Jr., please visit our Tribute Store. "Email Address" would like to share the life celebration of Victor M. Corey Jr.. Click on the "link" to go to share a favorite memory or leave a condolence message for the family.